For a lot most pet owners, a pet is part of the family. Before my children were born, my cat was my first ‘baby'. The day you bring home a new pet is a momentous occasion to be celebrated. 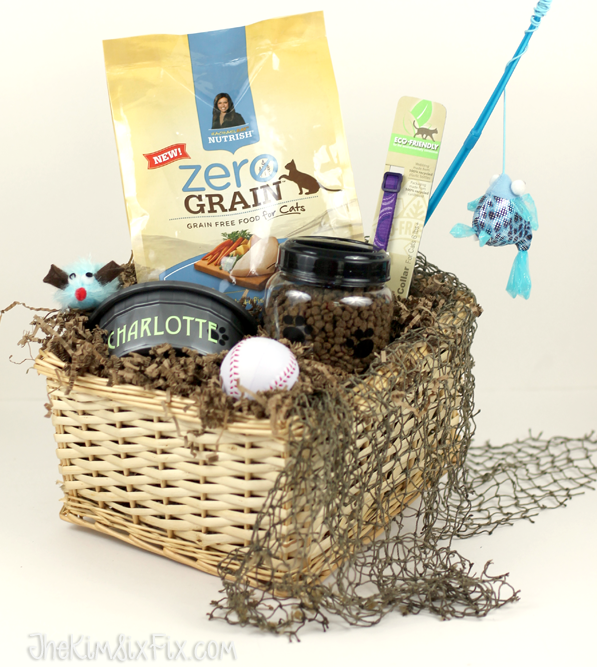 So I thought it would be a fun idea to create a "New Pet Welcome Basket" to congratulate a family on their new addition. So much more special than a generic dish! Other ideas for things you could include: Treats, a leash, a brush, etc. Isn't it a sweet idea to think a new pet gets to come home to a dish with their name on it? 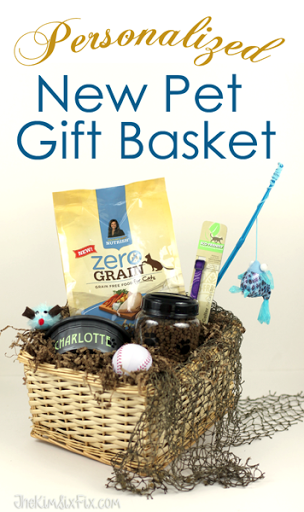 Plus, by including Rachael Ray Nutrish in your gift basket, it helps get a new pet off to a great start. Rachael Ray's line of pet food (she also has a line for dogs) has zero grains, glutens or fillers, by products, artificial flavors or preservatives. The number one ingredient is REAL whitefish. I have been feeding it to my own 'fur-baby' (Charlotte.. yes.. this bowl was actually for her!) and she loves it! Plus I'd feel good buying it, since Rachael’s personal proceeds go to Rachael’s Rescue, created to help shelter pets. As of today, over $9 million has gone toward food, medical supplies and treatments for animals in need. You don't have to make a special trip to find Nutrish! This is the first premium pet food brand that will be available at your grocery store, Target, Walmart or even Amazon! I'd love for you to let your pet try it. Right now, if you buy Rachael Ray Nutrish Zero Grain Whitefish and Potato Recipe Cat Food, you can save $3 with this coupon! To find out more about you can also follow Nutrish on Twitter, Facebook or Instagram!